Nuage Networks, an Alcatel-Lucent spin-in venture focused on software defined networking (SDN), made its debut with the introduction of a Virtualized Services Platform(VSP) software suite aimed at automating data center infrastructure. 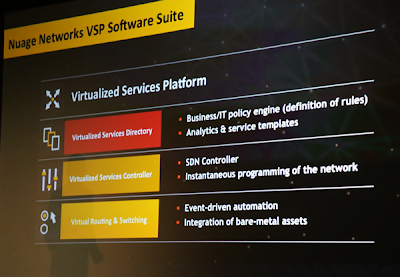 Virtualized Services Directory (VSD) -- it serves as a policy, business logic & analytics engine for the abstract definition of network services. Network administrators can define services using RESTful APIs to the VSD. Virtualized Services Controller (VSC) -- an SDN controller for programming the network. It serves as the control plane of the data center network, maintaining a full per-tenant view of network and service topologies. Nuage is supporting OpenFlow. Virtual Routing & Switching (VRS) -- provides event driven automation to connecting cloud services to VPNs. VRS serves as a virtual endpoint for network services, enabling changes in the compute environment to trigger instantaneous policy-based responses in network connectivity. Nuage Networks said the unique capability of its SDN controller is an ability to program L2-L4 network virtualization across thousands of tenant slices in a heterogeneous environment. Nuage will use standard IETF protocols, such as BGP, to peer with existing networks, allowing it to discover full network topology and reachability. It will use Openflow to distribute switching and routing information to hypervisors within the virtualized datacenter network. Nuage has trials underway with France's SFR, Canada's TELUS, the University of Pittsburgh Medical Center, and UK cloud service provider Exponential-e. 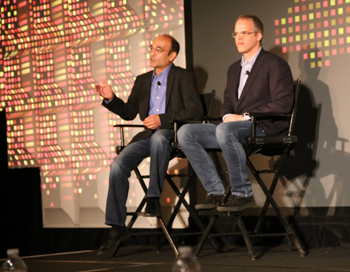 Speaking at a launch event in Santa Clara, California, Alcatel-Lucent's Basil Alwan said the opportunity for Nuage extends beyond transforming the cloud data center, as the "end game" is really about extending cloud bursting end-to-end across the WAN. He coined a new acronym -- software defined virtual private networks (SDVPNs) -- as the means connecting SDN controllers in the data center with MPLS VPNs. Nuage is headed by Sunil Khandekar, who previously was VP of business development for Europe, Middle East, and Africa (EMEA), as well as VP of global product management for Alcatel Lucent’s IP Division. NTT Communications has selected Compass-EOS' new r10004 core-grade modular routers for use in its high-capacity transpacific network. 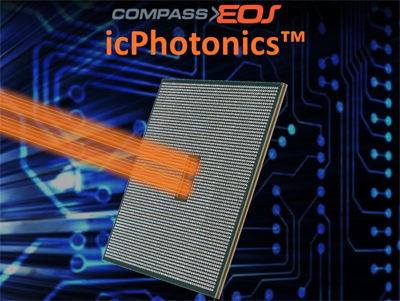 The Compass-EOS routers are the world’s first direct silicon-to-photonics-based routers. Last month, Compass-EOS unveiled its radical silicon-to-photonics router that essentially leverages an on-chip optical mesh and electronics to route high-densities of 100GbE and 10GbE. The company's first product, r10004, is a carrier-grade, modular platform offering 800 Gbps Capacity in a 6U enclosure. It offers 2 x 100G ports or 20 x 10G ports with full Layer 3 routing functionality for core, peering or aggregation deployments. Midokura, a start-up with offices in Tokyo, San Francisco and Barcelona, announced $17.3M in Series A funding for its network virtualization technology. Midokura offers an overlay-based network virtualization technology that allows cloud users to provision virtual network devices, including virtual switches, routers, firewalls and load balancers. Virtual network devices can then be connected to virtual machines, as well as other virtual network devices to create complex network topologies. Midokura said its solution can be fully distributed and can be scaled out incrementally as demand increases. With MidoNet, users can virtualize the network stack for popular cloud platforms and reduce associated costs of managing the network. The round was led by Innovation Network Corporation of Japan (INCJ), a Japanese public-private partnership. Other investors who participated in the round include NTT Group’s Venture Fund: NTT Investment Partners, L.P. and NEC Group’s Venture Fund: Innovative Ventures Fund Investment L.P.
Midokura also named Dan Mihai Dumitriu as its CEO. Mihai is a co-founder and previously served as CTO. Fellow co-founder Tatsuya Kato, who had been serving as CEO, is now Chairman of the Board. 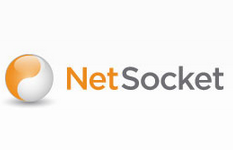 NetSocket, a start-up based in Plano, Texas, raised $9.2 million in Series B funding for expansion of it network assurance expertise into SDN. NetSocket currently offers a Cloud Experience Manager (CEM) that provides insight into network issues. The funding round was led by new investor Venture Investors, with participation by existing investors Sevin Rosen Funds, Silver Creek Ventures and Trail Blazer Capital. The Verizon Financial Network is delivering low latency connection directly to New York metro financial markets from CME Group's data center in Aurora, Illinois. The CME Group Aurora data center is home to the CME Co-Location Services offering, which caters to more than 100 direct customers. The ultra-low-latency round-trip route bypasses traditional area "data hotels." Specifically, the new Aurora-to-Carteret, N.J., route offers very high speed transmissions with ultra-low latency as low as 14.997 milliseconds round-trip. Verizon is using Ciena's 6500 Packet-Optical Platform. The IEEE has established a new study group to consider initiating a formal project to standardize 4-pair Power over Ethernet (PoE). A 4-pair Power over Ethernet implementation could provide greater than 25.5 Watts of power. "The formation of this study group will allow collaboration on a proposal for the development of a 4-pair PoE standard, which would allow support of new PoE applications in the areas of IPTV, industrial Ethernet and more," said David Law, chair of the IEEE 802.3 Ethernet Working Group and distinguished engineer with HP Networking. "A 4-pair approach would result in increased efficiency, since the use of additional pairs results in lower channel resistance." Taiwan's Chunghwa Telecom appointed Dr. Yen-Sung Lee as Chairman and CEO, replacing Dr. Shyue-Ching Lu who resigned from his position as Chairman and CEO due to personal reasons. In addition, Mr. Mu-Piao Shih was appointed President of the Company, succeeding Dr. Lee. Dr. Yen-Sung Lee previously served as the President of Chunghwa Telecom since his appointment in 2012 and has worked at Chunghwa Telecom for 39 years. Prior to becoming President, he served as the Senior Executive Vice President in charge of the marketing and IT departments. Dr. Lee has been instrumental in the Company's ICT & cloud business development over the past several years with his extensive background in information and data engineering. Reliance Jio Infocomm Ltd. and Reliance Communications reached a deal under which Reliance Jio Infocomm will share multiple fiber pairs on RCOM’s nationwide inter-city fiber optic network infrastructure. As per the agreement, Reliance Communications will in turn have reciprocal access to optic fiber infrastructure to be built by Reliance Jio Infocomm in the future. The deal, which was valued at approximately Rs. 1,200 crore (US$221 million), also represents a reconciliation between the Ambani brothers.